Braintech solutions will guide robots manufactured by ABB Inc.'s Robotic, Automotive and Manufacturing Group to locate heavy transmission castings on pallets (called "dunnage"), move the castings to a work area, and then pick up the empty dunnage and place it on a conveyor. This vision guided robotic solution will enable them to do away with expensive precision dunnage used in the past, and instead switch to inexpensive part trays. Braintech's VGR technologies are revolutionizing manufacturing by giving industrial robots the "eyes" to handle and assemble parts with a high degree of consistent quality and productivity. In Robotic Nation I predict that one of the first professions to be automated out of their jobs by robots will be pilots. Therefore I get a lot of mail from pilots telling me that I am wrong. I think the thing that will hasten the elimination of pilots is human error. This week there were two news stories that made the problem of human error painfully apparent. One error occured here in Raleigh, NC where I live. A pair of F-18 fighters landed at Raleigh-Durham international airport to refuel. When they took off again, one of the planes had a problem as it was rolling down the runway. The pilot ejected and landed safely. That would seem like the end of the story. However, the now pilot-less plane was still rolling down the runway at a major commercial airport. It ended up swerving off the runway, crashing in the grass and bursting into flame. If it had swerved just a little earlier, it would have crashed right into the middle of Terminal A, full of people, and burst into flames there. Obviously a robot would have had no reason to eject, and would have stayed with the plane. An Aloha Airlines co-pilot was arrested for allegedly being intoxicated as he was about to board a plane he was scheduled to help fly from California to Hawaii, the carrier said. The pilot had a blood-alcohol level of .182 percent, more than twice Hawaii's legal limit of .08 percent to operate a vehicle, Federal Aviation Administration officials said Monday. Had he not been arrested, he would have been flying around with hundreds of lives at stake. You might counter by saying that no drunk would ever be allowed to board and pilot a plane, but then you have to explain how the Exxon Valdez had a drunk at the helm when it crashed in Alaska. Even if most human pilots are competent, there will always be some who are not, even if only temporarily. Humans have a tendency to get sleepy, drunk, sick, etc. on occasion. Accidents do happen. In contrast, robots get better and better each year through incremental improvement. Yes, robots make mistakes. But when they do, the mistakes are corrected and never happen again. Thus, the safety record of robots is always improving. Eventually, the robot is better than the human, and all the humans are replaced. That is why there will be no pilots in the cockpit in 10 or 15 years -- autopilots will eventually be better than human pilots, and people won't want to risk their lives on the less-reliable human pilot. With this week's announcement of Microsoft's Speech Server 2004 (see this article and this one), automated call centers are in the news. The systems that are coming out right now are very interesting because they work remarkably well. They are simple, yes. Consider that automated systems like this were impossible just a couple years ago, however, and you can see the trendline. Things will progress quickly from here. Call 1-800-555-1212 and get a number. For example, ask for the number for American Airlines. It is a very simple system, but very good. Unless you have a bad accent, it will handle your request flawlessly. Using the number you just obtained, call American Airlines and press 1 twice to get into the flight information system. Ask about the flight departure time of a flight between two large cities, like New York and Atlanta. It is not quite as simple, and definitely works better if you are calling about a real flight rather than one you pick out of the air, but it's a very nicely done "personality" and it works well. If you have a prescription with CVS pharmacy, try using their automated refill service. I use it about once a month. The most amazing part -- If a prescription has expired, it tells you that, then calls your doctor to get it renewed, then calls you back the next day to say that the medicine is ready! No low-wage worker in Shanghai, New Delhi, or Dublin will ever take Mark Ryan's job. No software will ever do what he does, either. That's because Ryan, 48, manages people -- specifically, 100 technicians who serve half a million customers of Verizon Communications Inc. (VZ) out of an office in Santa Fe Springs, Calif.
Fire Mark Ryan and let two of his former co-workers manage 150 people each. That process is very likely why Mark Ryan now manages 100. Replace Mark Ryan with a Manna system. Let a computer manage the people. Replace Mark Ryan with a manager in India who works for $6,000/year and manages everyone by telephone/email. It is likely that Mark Ryan already manages everyone by telephone/email, so what difference does it make if "Mark Ryan" is an Ameican or an Indian? The phrase "no one will ever take Mark Ryan's job" is ridiculously optimistic. New research by economists at Massachusetts Institute of Technology and Harvard University concludes that the key factor is whether a job can be "routinized," or broken down into repeatable steps that vary little from day to day. Such a job is easier to replace with a clever piece of software or to hand over to a lower-paid worker outside the U.S. By comparison, the jobs that will pay well in the future will be ones that are hard to reduce to a recipe. These attractive jobs -- from factory floor management to sales to teaching to the professions -- require flexibility, creativity, and lifelong learning. They generally also require subtle and frequent interactions with other people, often face to face. When was the last time you talked to anyone face-to-face in a business setting? More and more people are now working from their homes and can go for weeks without ever talking to anyone face to face. Everything at work is handled via email or the phone. Then you go out and run some errands -- you talk to no one at the bank (ATMs), the gas station (credit card at the pump), the grocery store (self check out), the home improvement store (self check out), Wal-Mart (self check out), the book store (Web e-commerce), the dry cleaners (leave your clothes at your door, request pickup in a Web site). Even doctors are being automated -- this article from back in 2001 talks about it. In short "The Future of Work" is that there will be less and less work left for people to do, and the pace of that transition is accelerating. That is why we should be thinking about how to redesign the economy, rather than praying that we can find some sort of job that will not evaporate in a couple of years. I went to Wal-Mart tonight, and our local store in Cary, NC has four brand new self-checkout aisles installed and operational. This is the first time I have seen self-checkout systems in a Wal-Mart. Now that America's largest retailer is using them, expect every other retail chain and supermarket to follow Wal-Mart's lead. Self-checkout aisles will spread as rapidly as automated gas pumps and ATMs did. Right now, self-checkout is the exception. Soon it will be the norm. Perhaps one million retail employees (especially cashiers in grocery stores, because many of them still have decent pay and benefits) will be out of work over the next three to five years. What new jobs will the economy create to absorb these jobs that are lost? How much will those new jobs pay? What will happen when the unemployed cashiers collide with the unemployed factory workers in the unemployment office? Or with the unemployed IT workers and other off-shored employees? Welcome to the Robotic Nation. Another event with real-world applications was the firefighting competition. In this challenge, robots roamed through a miniature residential floor plan, seeking out and extinguishing a candle flame. Joseph Miller and his son Andrew of Santa Rosa, California, designed and built Zippo, the winning firefighter. "I chose the simplest algorithm, which is just to follow a wall, and it paid off," Joseph Miller said of his strategy. Miller said he hopes robotic firefighting competitions will lead to technology that will someday save lives. Global competition is pressing American farmers on many fronts. American raisins are facing competition from Chile and Turkey. For fresh tomatoes, the challenge comes from Mexico. China, whose Fuji apples have displaced Washington's Golden Delicious from most Asian markets — and whose apple juice has swamped the United States — is cutting into American farmers' markets for garlic, broccoli and a host of other crops. "The rest of the world hand-picks everything, but their wage rates are a fraction of ours," said Galen Brown, who led the mechanical harvesting program at the Florida Department of Citrus until his retirement last year. Lee Simpson, a raisin grape grower in California's San Joaquin Valley, is more blunt. "The cheap labor," he said, "isn't cheap enough." "Cheap labor isn't cheap enough" is one hallmark of the Robotic Nation. Humans simply cannot compete with the price and benefits of robotic labor, and this will mean massive unemployment as robots reach parity with human beings. See this post for a solution to this problem. "The machinery dealer wanted something like $60,000 or $70,000 for [four used robots], but we haggled them down to $40,000," says Jeff Shoemaker, an industrial engineer who heads four divisions at the firm. "That still may seem like a lot, but with the rising cost of health insurance for our employees, the cost of a robot is pretty easily justified." Those four robots--along with seven more purchased since then for various tasks such as welding and loading--have allowed Allied-Locke to get more production out of the same number of workers. And that has helped it avoid new hiring. That sort of situation represents the other face of the well-publicized issue of America's declining manufacturing employment. If American workers aren't losing jobs making Nike sneakers to Vietnamese workers, then they are losing out to machines as companies look to increase productivity. The article also points out that, "North American manufacturing companies shelled out $877 million for robots--up 19 percent over 2002." Marshall Brain, founder of the popular online encyclopedia HowStuffWorks.com, has written an influential online manifesto called "Robotic Nation" in which he concludes that the greater presence of robots in the workplace will lead to massive unemployment over the coming decades. "The jobless recovery is exactly what you would expect in a robotic nation," he writes. if robots displace enough workers, the laws of supply and demand will cause their wages to fall, meaning it will no longer be cheaper for the firms to replace them. "True, the existence of automation might depress workers' wages," Miller adds, "but it shouldn't ever leave them unemployable." As it turns out, wages are in fact falling. As pointed out in the article New jobs just don't pay well, "A national study says the new jobs being created pay 21 percent less than the jobs they replace." So what we have to look forward to in the Robotic Nation, in the best case, is a situation where wages and benefits are falling dramatically. For 200 years in America the trend has been toward a rising standard of living. Robots are now in the process of reversing that trend. See this blog for details. The thing that Miller is missing is the example mentioned up top. The robots in that example only cost $40,000. They replaced human workers who have wages, health insurance costs, sick days and so on. Human workers only work 8 hours a day 5 days a week (8x5), while the robots work 24x7. Robots never get cancer. Robots never take vacation. Robots never need time off to care for sick children. Robots never injure themselves on the job. Robots get better and better every year as technology advances. And the prices for robots will be falling, just like the prices for VCRs and microwave ovens have. There is no way that a human can compete with a robot on wages, no matter what happens with supply and demand curves. That is the nature of the Robotic Nation. See this post for a solution to the problem. What if new jobs never happen? On the left of the Democratic Party, they don't come any smarter than Barney Frank, the 12-term congressman from Massachusetts. Republicans enjoy debating him, because if you've beaten him, you know the next liberal will be easier. That is the basic reason, he suggests, for this jobless recovery -- why month after month the economic growth figures spell boom, and month after month unemployment remains stubbornly high and more thousands become so discouraged they give up the search for work. Frank seems to be missing the point of the Robotic Nation. The same technology that is improving productivity/efficiency and eliminating jobs today will soon affect every aspect of the employment landscape. It will affect police officers, fire fighters, highway construction/repair crews, etc. in exactly the same way. Fewer jobs will be available once robots are doing all the work. It is time to rethink how the economy works. Instead of taxing wealth and giving the money to government, we should instead give the money directly to citizens for them to spend as they choose. In this way, all citizens acheive true financial freedom and are able to live their lives without jobs. They are free to do as they like. See Robotic Freedom for details. A robot Christ was used for crucifixion scenes in Mel Gibson's new film, The Passion of The Christ. According to this article: Mel Gibson manipulated a remote control to move the robot on the cross. Apparently, no one is immune to robotic replacement. U.S. jobs devoured - "The same kind of productivity-enhancing, job-shrinking makeover that occurred at Navistar's once-grimy engine plant is playing out in factories across America. In automating their plants as part of a stepped-up search for efficiency, American companies are vaporizing tens of thousands of jobs every year." Robotic dairy - video file shows a completely automated dairy that needs just one person to keep it running. ChatNannies program scans for pedophiles - A fascinating development. Thousands of software robots are now impersonating children on the Internet to help catch pedophiles. Invasion of the robots - From medicine to military, machines finally arrive - "Mobile, intelligent robots that can perform tasks usually reserved for humans are starting to creep into mainstream society and could become a multibillion-dollar market in a few years." Gov't Pushing for Research on Robotics - "The success of unmanned drones that have proven their mettle in combat since the Sept. 11 terrorist attacks has prompted an unprecedented push for new research at universities with advanced robotics laboratories. Robotics and mechanical engineering departments report an influx of cash from the Department of Defense to build land vehicles, boats and aircraft that don't need soldiers, sailors or pilots to operate them." Robo-talk helps pocket translator - "Papero is the first all-hearing, all-seeing robot to be able to talk in conversational colloquialisms." There is tremendous excitement about a manned mission to Mars right now, but tremendous concerns about costs and safety. This article proposes a very different way to think about the mission -- what if we make maximal use of the coming robotic technology to augment human beings? It sounds far-fetched until you read the article. See A Revolutionary Mission to Mars for details. Using voice-recognition middleware developed by ScanSoft, Lifeline can recognize over 5,000 words and 100,000 phrases. In practice, that means that the game's main character, Rio, will understand anything that's relevant to her predicament, as well as many things that aren't. Lifeline is thus a unique step toward deeper player immersion in the game world, but not simply because of the technology. It's because although Rio is the main character, "you" are not Rio -- "you" are another survivor, trapped in the security room of the space station, who is watching Rio on the security monitors and giving her advice. So in real life you're sitting in a chair with a headset on, holding a controller and watching a monitor, while "you" in the game does the exact same thing. It won't be long before the "person" who takes your order at the drive-through, or who takes your call on the help line, is a robot rather than a human being. A $1 million race across the Mojave Desert by driverless robots ended Saturday after all 15 entries either broke down or withdrew, a race official said. Two of the entries covered about seven miles of the roughly 150-mile course while eight failed to make it to the one-mile mark. Others crashed seconds after starting. Lots of people wrote to send me links like these, and the gist of the message was, "See, humans have nothing to fear from robots taking over the workplace -- robots will never be able to drive trucks." These folks are missing the key feature of the Robotic Nation: incremental improvement. However, the distance travelled by Sandstorm and its 40 mph (65 km/h) speed still surpassed the achievements of any previous autonomous vehicle.... The Department of Defense had to date come up with an autonomous truck that travels at 12 mph (20 km/h) for a maximum of six miles (10 kilometres). As of March 13, robots can now drive 3 times faster and one mile further than they ever have before. Because of Moore's Law, the computers used in these robotic vehicles will have twice as much computing power, twice as much memory and twice as much disk space available. The research will advance because of the lessons learned in this race, software will get better, etc. Many more teams will be competing because of all of the publicity this race got. For example, dozens of universities will be able to field entries the second time around. So will hundreds of independent teams. People will develop solutions to some of the problems seen in this race. For example, one entrant got tangled up in barb wire (that could have happened to a human driver too -- barb wire is not so easy to see). But now the robotic vehicles will be redesigned so that they can detect and avoid barb wire. So in 18 months, DARPA will run the race again, and lets say the winning contestant goes 14 miles. 18 months after that the winning contestant will go 28 miles. Then 56 miles, then 112 miles, and then finally a robot will complete the course. On that schedule, we have autonomous robots able to drive 150 miles on their own in just 7.5 years. But the robots won't stop there -- they will keep getting better and better, just as computer chess machines did. In 15 years or so, robots will be driving trucks better than human drivers can. The robots will be safer and more reliable. They won't get lost. They will cause a lot less accidents. They will always follow traffic laws. They will never drive while drowsy or drunk. They will also cost a lot less than human drivers, and they will run 24x7. At that point, more than a million truck drivers will be out of work. The transition to robotic truck drivers probably happens in 2020 or so. See Robotic Nation for details. Tokyo's Philharmonic Orchestra has a new member. Qrio, an experimental robot built by Sony, joined the orchestra for rehearsals on Tuesday. The robot served as conductor for the group, leading them through rehearsals of Beethoven's Fifth Symphony. The orchestra's full-time conductor says he was very impressed with Qrio's performance, and that the robot's movements were much more fluid than he had expected. Toyota developed artificial lips that move with the same finesse as human lips, which, together with robots’ hands, enables the robots to play trumpets like humans do. Lots of other articles covered this story, including this one, this one and this one. See also this post. All kidding aside, the point here is simple: there is truly no limit to what robots will be able to do in the near future. Who would have expected a trumpet-playing robot to appear, especially from a car company? It will not be long before robots are taking over millions of jobs -- even jobs that would seem to be sacred, like the ones in the symphony orchestra. See this post and this one for further details. This article is fascinating to me on several different levels: Bush pick bows out after Dem criticism. The article is talking directly about the Robotic Nation we now live in. A Nebraska businessman [Anthony Raimondo] withdrew from consideration to be the White House's manufacturing "czar" Thursday after withering attacks by Democrats about his ties to China. Anthony Raimondo is the CEO of Behlen Manufacturing Co., and the withering attacks came because Behlen is busy opening a factory in China. The goal of the manufacturing czar, of course, is to try to preserve America's manufacturing jobs, two million of which have evaporated since the president took office in 2000. The first thing you notice in the article is the political problem. If you are picking a new "manufacturing czar", it would make sense to ensure that everything he/she does is "Made in America." Only if you do not understand just how angry Americans are about offshoring would you make a mistake like this. off-shoring jobs to China as fast as he can. Or both. The reason is because he has no choice if he wants to stay in business. If all of your competitors are cutting labor costs as fast as possible, you have no choice but to do the same thing. Otherwise you cannot compete on price. If you cannot compete on price, then you go out of business. Maybe there is someone who is manufacturing such a highly branded product, or such a patent-protected product, that his/her company is immune to pricing pressure. But that situation is rare in manufacturing today. It is the third thing, however, that is most important, and it is this: It is pointless to appoint a manufacturing czar, because there is no way to stop what is happening now. Robots are going to create completely automated factories in the very near future. In 15 or 20 years, there will be zero people in America working in manufacturing jobs. Today there are roughly 15 million Americans working in manufacturing jobs. The math is easy -- every year for the next 15 years, a million or so Americans will lose their manufacturing jobs. It is as simple as that. There is nothing that any president or czar can do to stop it. What the president should be doing is appointing an employment czar to figure out what those 15 million unemployed people are going to do after they are fired from their manufacturing jobs. Will they end up seeing their salaries and benefits being cut in half when they go work at Wal-Mart? Or will they be permanently unemployed? Or will we face the facts and change our economy in preparation for the Robotic Nation? We are assuming that the economy is going to invent an entirely new category of employment that will absorb half of the working population. Why isn't the economy inventing those new jobs now? Today there are millions of unemployed people. There are also tens of millions of people who would gladly abandon their minimum wage jobs scrubbing toilets, flipping burgers, driving trucks and shelving inventory for something better. This imaginary new category of employment does not hinge on technology -- it is going to employ people, after all, in massive numbers -- it is going to employ half of today's working population. Why don't we see any evidence of this new category of jobs today? You may have seen this week that Hitachi announced its new 400 GB hard disk: Hitachi Pushes Hard Drive to 400GB. This drive uses 5 platters and stores data at a density of 61.7 gigabits per square inch. Hard disks have been doubling in capacity for decades at a pace better than Moore's Law, but people write to me constantly to say, "it won't last -- we are about to bump into physical limits and Moore's Law will end." Scientists at IBM Research have demonstrated a relatively inexpensive way to use heat to make it easier to write magnetic patterns on such media. The technique could make it possible to store more than one terabit per square inch... recording speeds of more than one billion bits per second, or gigahertz, are possible, according to the researchers... The researchers' prototype achieved magnetization patterns capable of storing 400 gigabits per square inch. The technique could be used practically in five to ten years. So today's technology is storing about 60 GB per square inch. IBM has a prototype disk that can store 400 GB per square inch. That would allow the creation of 2.6 terabyte drives. One terabit per square inch would allow the creation of 7 terabyte drives. Imagine a home computer with a $200 hard disk in it that can store 7 terabytes. If it arrives in 10 years, that would be right on schedule. The thing about Moore's law is that there are thousands and thousands of scientists and engineers working on advancements every day. And once robots actually start adding to the creativity pool, Moore's law may even accelerate. As mentioned in Robotic Nation and Robots in 2015, there has been very little automation in the construction industry over the last century. In 1950, guys with circular saws and hammers built houses. Today it is guys with circular saws and nail guns. As a result, labor represents a sizeable portion of the cost of a new home. The industry is ready for automation. Obviously there will be plenty of things for humanoid robots and specialized robots to do on the construction site. There are so many repetitive, mindless tasks to keep the robots busy: framing, roofing, siding, brick-laying, painting, digging, plumbing, wiring, sheetrock hanging, etc. A robot for "printing" houses is to be trialled by the construction industry. It takes instructions directly from an architect's computerised drawings and then squirts successive layers of concrete on top of one other to build up vertical walls and domed roofs. The precision automaton could revolutionise building sites. It can work round the clock, in darkness and without tea breaks. It needs only power and a constant feed of semi-liquid construction material. "The goal is to be able to completely construct a one-story, 2000-square foot home on site, in one day and without using human hands,"
The "in one day without using human hands" part sounds amazingly like Terrafoam. In addition, there are references to low-income housing, as well as to the use of mud and straw as a building material. Perhaps all of the displaced workers of the future will be living in mud huts erected by robots? See Manna for a view of this future. The construction industry employs roughly 6 million people in the United States today. Robots will be able to move in and eliminate millions of construction jobs. There is something else to consider as well. Normally it is good for automation to lower the price of things. In the housing market, however, falling house prices can create some very uncomfortable problems. If house prices fall and home owners are underwater in their mortgages, they are trapped. Everyone has always assumed that home prices will increase in value from year to year, and the leverage that a mortgage provides works well when prices are rising. But if robots and other technologies cause housing prices to fall 25% to 50%, the leverage of a mortgage works the other way and can bankrupt a family very easily. A large number of defaults could ripple through the economy in unexpected ways. It will be very interesting to see what happens as robots begin a rapid infiltration into the construction industry. SmartMart is the world's first fully automated, drive-through convenience store. The pilot SmartMart opened last May in Memphis, Tenn., and quickly turned profitable, according to Rivalto. Sales now run about $30,000 a month, he says, and overhead is 62 percent lower than in stores manned by people. Several oil companies are interested, and Rivalto hopes to open 100 new stores by the end of 2005. If this model works and overhead is 62% lower, then convenience stores can be expected to automate quickly. There are about 130,000 convenience stores in the U.S. If you assume that each one has an average of 4 full-time employees, then as these stores all automate, it pushes 500,000 or so people out of work. The knee-jerk reaction is for people to think, "There is no way convenience stores will automate. There will always be a person behind the counter." But think back to how quickly credit-card-taking gas pumps have spread. 10 years ago they were rare. Today they are very nearly universal in the U.S.
Read more about it (and see a photos/video) here. David Kirkpatrick had written an article about how beneficial off-shoring is for the U.S. economy. In response, he received "the biggest outpouring of letters ever." He states: "I've been given a sudden and bracing education in just how angry Americans are about what's happening with jobs. " Here is why Americans are so angry: They are scared to death. Here is why they are so scared. Good, high-paying IT jobs are being taken away from Americans and shipped to India and China right now. The people in India and China who are taking these jobs are making something like $6,000 per year for their labor. There is no way an American can compete with that. $6,000 per year is less than $3 per hour, or about half of the U.S. minimum wage. So offshoring will eliminate a huge number of IT jobs in the U.S. There is no stopping it, and it will not stop at IT. Accounting, financial analysis, reporting, writing, film making, customer service, billing/payroll, editing, illustration, engineering, design, manufacturing, etc., etc. -- millions of jobs across a wide spectrum of white-collar and blue-collar activities -- can all move off-shore to some degree. And they will. Off-shoring is not new. It has been happening to factory workers for several decades. However, politicians, white-collar workers and writers like David Kirkpatrick were unaffected. They could smugly say to factory workers, "You may not like it, but this is good for the economy." It might be good for "the economy", but I have never met the economy, nor its spouse and children. "The economy" does not care about the lives and families of human beings. So millions of factory workers lost decent jobs in factories and ended up in trash jobs at McDonald's and Wal-Mart. Yes, many people got rich and were able to concentrate massive amounts of wealth. The economy did grow. But millions of people are doing worse now, not better. [And, if you think about it, there is no need for that to have happened -- Wal-Mart could pay workers twice what it is paying them now with no downside.] That same unfortunate process is now happening to white-collar workers, and it is terrifying to anyone with a family and a house payment. At the same time, the leading edge of the robotic revolution is just starting to hit the American economy. Robots are going to rip out tens of millions of McJobs within a decade or two. Simply look at the dozens of entries in this blog to see just how profound an effect robots will have on America's employment landscape within the next 20 years or so. To put it succinctly: The American people are about to watch tens of millions of American jobs evaporate because of the twin forces of off-shoring and robots. Americans are beginning to understand what that means. And it is terrifying. Why isn't the economy creating those new jobs now? Today there are millions of unemployed people. There are also tens of millions of people who would gladly abandon their minimum wage jobs scrubbing toilets, flipping burgers, driving trucks and shelving inventory for something better. This imaginary new category of employment does not hinge on technology -- it is going to employ people, after all, in massive numbers -- it is going to employ half of today's working population. Why don't we see any evidence of this new category of jobs today? What, exactly, are we going to do to solve the problem? See Robotic Nation and Manna for possibilities. "Imagine an elderly person might one day have a robot to perform many of the tasks now handled by a human caregiver. The robot wouldn't be as smartalecky as the TV Jetsons' Rosie, but it would be able to talk back. It might also provide a link to relatives who can use the robot to check on an elderly person. Such robots aren't available yet, but preliminary work is being done on caretaker robots by several universities. Researchers at Carnegie Mellon University and the University of Pittsburgh are working on a nursebot. It will be able to give reminders to take a medicine or about a scheduled doctor's appointment. The nursebot will be linked to professionals such as doctors who could then interact with their patients. The robot will also help manipulate objects, a big help for seniors with arthritis." Pretty soon, a robot named Wakamaru may become a fixture in the homes of elderly Japanese who have no one else to look after them. Cell phone on board, and can call 911 if something is seriously awry. On board camera that can let people see what the robot sees remotely. Speech understanding software allows it to follow simple commands. "In-home health care" has been described by many as one of the big, new job categories. It is supposed to take off in the U.S. as the population ages, and this new job category is supposed to absorb many of the people displaced from other industries by robots. Obviously this won't be the case if much of the home health care work can be handled by robots too. Technology like Wakamaru would allow one person sitting at a control screen to monitor hundreds of patients simultaneously in their homes. And Wakamaru is going to get better and better and better over time. 20 years from now, Wakamaru will be able to start IVs, administer drugs, etc. See Robotic Nation for details. A robotic bath -- esentially a big washing machine for humans. 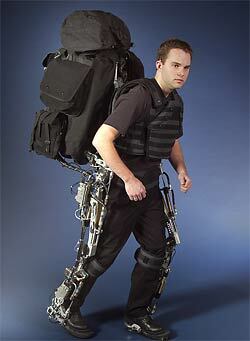 A robot suit, similar to an exoskeleton, used to provide mobility for the elderly. A 3-foot-high wheeled robot with cameras that people can control remotely to check on elderly relatives. So even though the human washing machine retails for almost $50,000, enough to pay a year's wages for two Filipino nurses, robotic home care may lie in the future for Japan's aging millions. One thing you can be sure of: You will be able to buy the robotic bath tub from a robotic manufacturer for $1,000 in just a couple of years. It will have a big effect on the number of human nurses employed in Japan. Video is available on this page. It looks pretty boring until you realize that the guy is carrying 170 pounds. "Many scientists and engineers have been attempting to build a robotic strength enhancing device since the 1950s, and they’ve failed," said Kazerooni. "It is only through recent engineering breakthroughs that this dream is now becoming a reality." It is the same with chess computers -- they were predicted in the 1950s, but they were not able to beat the best human players until about 50 years later. The reason why things like exoskeletons and chess computers are finally arriving is because Moore's Law has now given us the CPU power we need to fully implement these ideas. Now think about some of the other computerized technologies that everyone was predicting in the 1950s: video phones, artificial intelligence, computers that understand and respond to speech, cars that drive themselves, etc. And yes, robots were predicted in the 1950s as well. As discussed in Robotic Nation, Moore's Law is this same force that is going to give us all of these long-predicted technologies -- including intelligent, completely autonomous robots -- in just two or three decades. Video phones using VoIP on the desktop or using 3G in our cell phones will be here before 2010. Most airlines and many call centers (e.g. pharmacies, phone companies) have systems that understand simple human language and respond. In March 2004 the first race involving completely autonomous self-driving cars will take place. And so on. These new technologies, and especially the new robots, will replace human workers in much of the labor force. In the process, robots will completely change our economy. See Robotic Nation for details. The economy should shed its jobless label this year with the creation of about 2.6 million new positions, the White House forecast Monday... In the annual Economic Report of the President, the White House said the number of workers on U.S. non-farm payrolls was likely to rise to an average to 132.7 million this year from a 2003 average it thought would come in at 130.1 million... Last year, the Bush administration was looking for the creation of about 1.7 million jobs. But the economy actually lost 53,000 jobs, bringing the total number of jobs lost since Bush took office to 2.2 million... In part, the administration's expectation of a pick-up in jobs growth reflects a belief that growth in productivity, or worker output per hour, will slow from its recent elevated level. The fast pace of productivity gains has enabled businesses to boost output sharply with little new hiring. "After such an extraordinary surge, a period of slower productivity growth is likely as firms shed their hesitancy to hire," said the report, which was prepared by the president's Council of Economic Advisers. That weakness has also led to the slowest pace of wage growth for workers in 18 years, the longest average unemployment duration in 20 years and could step up the pressure on President Bush as he runs for re-election. Payrolls outside the farm sector grew by just 21,000 jobs in February, the Labor Department reported, compared with a downwardly revised gain of 97,000 in January. The unemployment rate held steady at 5.6 percent. Economists, on average, had expected 125,000 new jobs and unemployment at 5.6 percent, according to Briefing.com. "This is a terrible number," said Sung Won Sohn, chief economist at Wells Fargo. "The economic recovery is almost three years old, and the economy should be producing 200,000 to 300,000 jobs per month." Instead of 320,000 new jobs in February, as predicted by the White House, we got 21,000. Nearly Half of Black Men Found Jobless - From the article: " 'It definitely reflects that black men disproportionately have had to carry the burden of the unemployment situation in New York City,'' Lizzette Hill Barcelona, executive director of Strive New York, a work force development agency, said of Mr. Levitan's findings. 'Black men are usually the least skilled. In a tough economy, those are the jobs that you can do away with.' '' As it turns out, the least-skilled jobs are also the first ones that robots and automation will eliminate. Teens often the losers in competition for jobs - Teens are finding it incredibly difficult to find jobs because desperate adults are taking them. "The percentage of 16- to 19-year-olds holding jobs nationally is the lowest it has been since the government began tracking statistics in 1948." The problem we are facing is simple: if a corporation can create a factory that is completely automatic, it does not need to hire anyone. The economy grows, but jobs do not. If a corporation can build a computer system that answers most of the simple calls in a call center, it can lay off thousands of call center employees. If a corporation can buy trucks that drive themselves, it can fire all of its truck drivers. And so on. There is no correlation between "growth" and "jobs" if there are robots to do a lot of the work. If, at the same time, the economy is not creating many new jobs for unemployed factory workers, phone operators and truck drivers, then you can get lots of unemployment. Note also that we are seeing just the tip of the iceberg right now -- these trends will accelerate rapidly over the next 5 to 10 years. See Robotic Nation and the other entries in this blog for details. What are we going to do about this looming and very large unemployment problem? One possible solution is to recognize that once advanced robots can do nearly all the work, then human beings do not need jobs anymore. We should redesign the economy so that people do not have to work if they do not want to (or cannot find a job). In other words, we design the economy so that people have money to spend whether they work or not. The article Robotic Freedom talks about this solution in detail. The key idea in Robotic Freedom is the creation of a central account. Money flows into this account from a variety of sources, and everyone in America gets a monthly check representing an equal share of the money in the account (in the same way that the Alaska Permanent Fund has been paying every Alaskan resident hundreds of dollars per year for over the last 20 years). It is interesting that Bill Gates and Microsoft floated an idea this week that could provide money for the central account. This article describes the Microsoft proposal: Charge Consumers Pennys for Spam E-mail. The basic idea is simple: when people send email, they will pay a fee to do so. Such an approach, it is hoped, will cut down significantly on spammers. The email postage fee could be one stream of money flowing into the central account. We need to do something. Robots will eliminate at least half of the jobs in America over the next three decades or so. It is unclear that the economy will create replacement jobs for many of the jobs that are lost. The Concentration of Wealth is growing rapidly. The time to be thinking about and implementing solutions is now. Many companies monitor employee e-mail and Internet usage, and Web-based security cameras are commonplace fixtures in office buildings. However, technologies such as GPS and employee badges with radio frequency identification (RFID) tags promise to take employee monitoring to an entirely new level. Today's tracking systems can record, display and archive the exact location of any employee, both inside and outside the office, at any time, offering managers the unprecedented ability to monitor employee behavior. Although unionized employees, such as the police in Orlando, can fight the monitoring technologies, nonunion personnel have no legal recourse in the U.S., according to James T. Bennett, a professor at George Mason University who studies workplace privacy. "Employers are assumed to own any information that employees create, including information relative to their physical location," he says. In fact, with a few exceptions, such as video surveillance of restroom stalls, employers can gather any and all information about their employees. "There's an incredible lack of privacy rights for employees," says Marc Rotenberg, executive director of the Electronic Privacy Information Center. See Manna for a description of where this trend eventually takes us. Several companies are in the process of launching small humanoid robots. Sony has been showing QRIO at trade shows. It is the most capable of them, but QRIO is not yet for sale. The two newest robots are more like sophisticated toys. However, they do show that inexpensive humanoid platforms are emerging. They also show that the computer power needed for balance and navigation is getting less expensive and more capable. Real multi-speed fast dynamic walking, running, and turning. 67 pre-programmed functions including pick-up, throw, kick, sweep,dance, fart, beltch, rap, and half-a-dozen different kung-fu moves. There is video that demonstrates the robot on this page. Nuvo is more expensive -- several thousand dollars -- but is fitted with a digital camera that can send images to a PC or a cell phone. You can also control it from a cell phone (in Japan at least) so you can instruct the robot to move to a certain point in your home and you will be able to see what it sees. Nuvo understands voice commands and can pick itself up if it falls down. Videos are available if you click on the photos at the bottom of this page. These robots are both about 15 inches (40 cm) tall. Once they double in size and get a bit more capable, they will be about the size and shape of a human todddler. I own two 33-inch toddlers, and can tell you that a toddler is able to move anywhere in a human household -- up and down stairs, in and out of rooms, on and off furniture, etc. If you accidentally leave a door open to the outside world, they are off like a shot. Both of my children can move chairs to countertops, climb the chairs and get up on the counter. In fact, they will climb anything. They can open cabinets. They can get their tricycles out of the garage and ride them. They can turn lights on and off. They can get toys out and, with prodding, will put toys away. They understand simple voice commands like, "Get down off of that! ", "Put that down! ", "Absolutely not!" and "Don't you dare throw that! ", although they do not always obey and often say, "No!" I imagine that we will be able to purchase inexpensive robots with that level of capability (perhaps without the climbing nor the disobedience) within 10 years or so. As with soldiers and firefighters, there are many dangerous situations where robots can help police officers. The article describes a situation that recently unfolded in Oregon where an armed assailant had already killed one person and was firing on officers from a duplex. What neighbors saw last week as they stood vigil and waited for a resolution was a bottom-heavy piece of gear with double-wheeled articulated tracks, a small box with a camera on top of a metal rod about 4 feet high and a vertical "arm" with a gripping device resembling the business end of a giant set of pliers. It rolled down a ramp coming out of the back of the bomb squad truck and slowly moved toward the duplex. Springfield police declined to discuss exactly how they used the robot during last Monday's tense seven-hour standoff with Tomas Ortega-Benitez until completing an internal review. But dispatch records show that the machine was inside the duplex by 7 p.m. "standing by" near a bathroom and that by 7:10 p.m. the SWAT team was entering the building. It is interesting to note that this robot is armed, with both shotgun shells and tear gas. It is easy to imagine all sorts of robots handling security in the near future. They can patrol airports, schools, university and corporate campuses, subway systems, shopping malls, government facilities, stadiums and arenas, terrorist targets (power plants, nuclear installations, major bridges), etc., etc. -- at the perimeter, near the facility and inside the facility. They probably won't look like the Andros F6-A of course and they will be far more agile -- many will be humanoid, while others will be high-speed vehicles. I am able to speak about robots at many colleges, museums and conferences. When people think about the potential unemployment robots might cause, someone inevitably asks, "well, if unemployment reaches 10% or 20% because of robots, why won't the people simply revolt and destroy the robots?" The simple answer to that question is, "People won't be able to touch the robots." Robotic security forces will be protecting the robots, and these security forces will be impenetrable. We really need to think about this as a society before the robots arrive. Robots have the power to create what is essentially heaven on earth for every human being on the planet. Alternatively, robots have the power to imprison most of the people on the planet. We can choose either path, but only if we think about it ahead of time. The book Manna describes both possibilities. The paper Robotic Freedom talks about another possibility. We really do need to be thinking about and discussing the future, because robotic security forces and military forces will begin surrounding us within a decade. The Army's Future Combat Systems (FCS) program is intended to create a force that is as powerful as today's but substantially more nimble. The Army's goal is for both remote control and autonomous unmanned vehicles to be a major part of ground combat by 2010. "Military robots are being developed and fielded to do three things: perform the dull, the dirty and the dangerous," says military robotics pioneer Scott D. Myers, president of General Dynamics Robotic Systems in Westminster, Maryland. For a soldier on the battlefield, everything is dangerous. There are bullets, bombs and shrapnel whizzing through the air. Most everything happening on the battlefield is also dirty. Therefore, as mentioned in previous posts, Meyer's statement is a way of saying that in the near future there will be no humans on the battlefield. See this post and this one for further details. Three types of lethal robots are being developed for FCS. United Defense Industries is creating its Armed Robotic Vehicle (ARV), a 5-ton prowler armed with missiles and a medium-caliber gun turret. It will also provide targeting information for other weapons and seed battlefields with miniature sensors. Lockheed Martin's candidate is the MULE, or Multifunction Utility/Logistics and Equipment vehicle. Smaller than the ARV, the MULE will follow troops over rough terrain and urban rubble, carrying gear and ammo for infantry squads, carting back wounded soldiers, looking for landmines, or firing antitank weapons or machine guns. Both of these vehicles are already in the prototype stage and being tested in DARPA's unmanned ground combat vehicle demonstration program. A third likely system is the Soldier Unmanned Ground Vehicle (SUGV), developed by iRobot, the same company that makes the Roomba robotic vacuum cleaner. The SUGV will be a remotely operated reconnaissance and tactical robot. Able to climb stairs, the sensor-equipped, pint-size robot will allow soldiers to see around corners during urban street fighting. It might also be armed with a grenade launcher and equipped with directional microphones and motion detectors for overnight sentry duty, allowing ground-pounders to get some sleep. Note that all three of these robots are armed with things like machine guns, antitank weapons and grenade launchers. Intelligent robots will be actively seeking, targeting and killing human beings as early as 2010. See also this, this and this.